I’ve been following the limited and previously self-released works of Nhor since he (assuming it is a he) appeared on the magnificent compilation Whom the Moon a Nightsong Sings in 2010. A multi-talented artist, Nhor’s works bring together his own music, visual artwork, and writings. On his eponymous debut and the following EP, Upon Which Was Written Within The Stars, Nhor played wandering and luminous piano-centered hymns to the night. I love these early works and still listen to them regularly, but they are slightly marred by their static tone and nature. 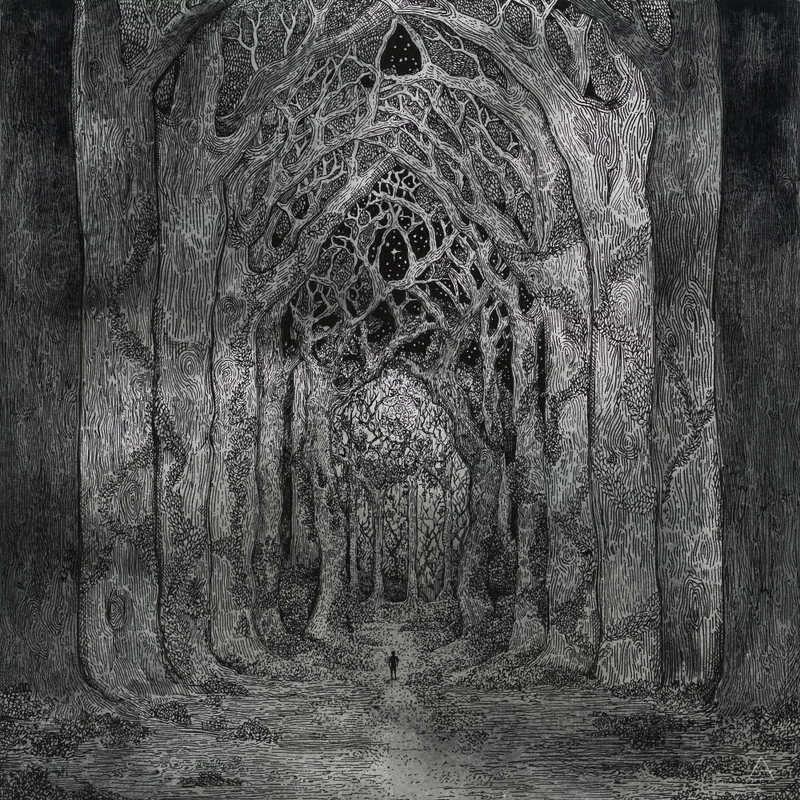 The ponderous and sad sense of wonder they evoke is so unutterably beautiful that it’s a critique I almost hate to make, but it seems to have been a limiting factor that Nhor himself was aware of, as the second album, Whisperers To This Archaic Growth, delved deeply into the rooted and earthen heritage of black and doom metal. This change enriched the project with a new sense of dynamics, allowing a more living, breathing, emotionally visceral soundscape for Nhor to explore. It had its flaws as well; to a certain extent it seemed like Nhor had yet to fully integrate the metal grit with his old piano glow, but it was still a strong album in its own right, and it boded well for future releases. Two years have passed since then, and Nhor has returned again with a (very much deserved) signing to Prophecy Records and a third album titled Within The Darkness Between The Starlight. “A Forest Draped in Moonlight” opens with a familiar sound for anyone who’s followed Nhor’s work: a solitary piano, shimmering like the first stars dripping light into the evening sky, followed by a forlorn and slow tread. It’s accentuated by a distant and sorrowful hum filling out the soundscape. It’s immediately apparent even from this relatively simple track just how much Nhor has matured since the beginning; both in production and the subtle, but powerful, progression of the track. This alluring intro does little to prepare the listener for the first track proper. It has an explosive opening; a howling scream, sweeping blast beats, and a tremolo riff that twists and turns like roots weaving their way deep into the black soil. It‘s all something thousands of bands have attempted before, but Nhor is one of those special artists with an uncanny ability to take the mundane and transfigure it into something utterly bewitching. This mythical air is helped immensely by the production and guitar tone; dense and appropriately rough, but still sharp enough to cut. Add to that the passionately throaty howls, occasional swelling leads, and clean vocals that chant or soar in all the right places, and what is left is an absolutely immense sound. And that’s without mentioning the bass, which almost deserves a paragraph of its own. It has a wild, rattling nature that’s always there if you’re listening for it, but never so prominent that it becomes obstructive to the songs as a whole. Two minutes into the second song and this is already one of favorite albums of the year, but it’s only just beginning. The storm of the opening reaches a moment of calm where the guitar croons a slow and mournful riff that seems ready to collapse under its own smoldering tone, while a haunting wail of a women glides like a dying heron over the dark pool of sound. The eerie atmosphere of it strongly reminds me of Jean Sibelius’ Luonnotar. The song doesn’t wallow here though, as a clear tension churns and simmers under the false peace. Nhor slowly, masterfully draws this tension forth with almost imperceptible shifts in the riffing. The drums start pounding, signalling the vocals and tremolo melodies to rise in intensity, until a stomach-dropping descent carries you back to the raging tempest of crashing bass and fiery riffs. It slowly concludes with a mournful Ebowed melody, then finally the main theme of the song on piano, isolated like the last light at the end of the world. This is the sort of song that one in a thousand musicians, if that, ever write. The next two songs are up to a similar level of intensity, beauty, and emotional impact. “Patient Hunter, Patient Night” initially hearkens back to Upon Which Was Written Within The Stars with its meditative ivory meanderings. It still luxuriates in the glimmer and glow of starlight, but its ecstasy in the sublime is more rooted and relatable thanks to a matured sense of songwriting and an expertly painted soundscape. It provides a welcome and necessary break from the tempestuous ferocity of the last song before it thunders into its own squall of climactic walls of doomy sound and furious blast beat driven charges, both of which are given an enriching counterpoint in the soaring clean vocals. “The Fall of Orion” follows with softer, lustrous clean guitar riff that briskly evolves into a feral, black metal version of itself. This beginning is a slower, far less bombastic display of Nhor’s grittier side, with an uneasy sense of wonder driven by complex, ever unfolding and metamorphosing riff-work. A little over halfway through the song fades into a murky haze of piano and forlorn guitar, then emerges again into a more active, intense exploration of the previous riffs. The overall impression is less immediately satisfying and moving than the previous two songs, but patient and attentive listening reveals a lot of intricately crafted riffing and a careful growing of tension throughout. “An Awakening Earth” serves as an interlude between the substantial tracks. A humming drone lays a dark pallor that unsettling and strange tones eerily fade in and out of. This is the point where Within The Darkness Between The Starlight starts to lose me to an extent. There’s been nearly 40 minutes of brilliant music, covering enough depth to leave a listener not only drained, but satisfied, and I’m not sure it was a wise or necessary choice to keep the album going at this point. The longer “Rohmet Etarnu” comes first. The polestar of this song is a simple piano melody, around which the trudging drums and the ebb and flow of riffs and vocals make fairly constant textural changes, but the only structural alterations in the song are subtle evolutions in the centerpiece piano melody. It is quite beautiful, but mostly inert, feeling more like an interlude or epilogue rather than a full song in itself. “The Temple of Growth & Glimmer Ascends” is the shorter follow up to this track, and while it has quite a different character; scintillating waves of moonlit synth and keys married to thickly branching riffs and vigorous drum work, it also suffers some from its static nature. That petrified character works a lot better on this second song due to the shorter length, and the way the clever arrangement of earthen metal with celestial other-worldliness creates a clear, painting-esque image. Don’t mistake my meaning; both of these songs are expertly crafted and vital with spirit, but their placement in the album doesn’t seem to serve the musical structure as a whole. The album itself is tied to a short story Nhor wrote that I won’t have access to until the physical album itself is in my hands, so I’m willing to give some leeway here in my suspicion that reading the story will give some insight into the structure of the album. But, based on only the listening experience, the content of this album does feel top-heavy in favor of the first 4 songs in a way that feels unnatural. Some trimming, or possibly even another energetic and dynamic song on the second half, could have relieved this I think. ~ by jakemoran on August 28, 2013. Great review, you pulled me in. It’s way too late for a working night to be still up but I’m entranced by the earlier works on the Nhor bandcamp. Beautiful. This entry was posted on August 28, 2013 at 6:36 pm and is filed under ALL REVIEWS, N-reviews, Uncategorized.You can follow any responses to this entry through the RSS 2.0 feed.You can leave a response, or trackback from your own site.